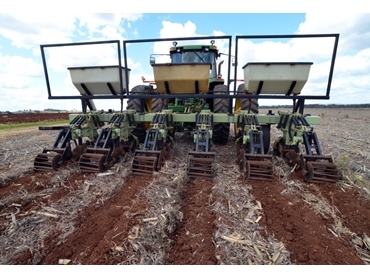 A unique tillage tool distributed in Australia by Muddy River Agricultural is helping Australian producers maximise profits through increased maize production. A growing number of Australian producers are likely to increase their plantings in the coming season with the ongoing drought in the United States pushing maize prices to an all-time high. Equipment choice will play a critical role in making the most of the favourable market conditions. Though a relatively minor crop in Australia compared to other summer crops such as sorghum and cotton, maize can grow in a wide range of geographical areas from tropical North Queensland to Victoria and Tasmania, making it a viable economic choice for many growers in the season ahead. Queensland grower, Peter Howlett has been cropping maize for four seasons and plans to continue his traditional 50% maize and bean rotation this summer in light of the current high prices. Peter uses the Orthman 1tRIPr pre-plant tillage tool, which combines strip till and nutrient placement at two depths in a single pass. The Orthman 1tRIPr pre-plant tillage tool helps Peter maximise profits with its ability to precisely place the nutrients at two depths in the seed bed two months prior to planting, saving him 30% on wasted fertiliser costs. Having the fertiliser in the seed bed ready and waiting delivers higher yields, about 20% higher than neighbouring growers who have sown crops using a different system in the same growing conditions. The tillage tool delivers great fuel savings as it achieves in a single pass what would take 4-5 passes on a conventional tillage system, saving up to 50% on fuel. The Orthman 1tRIPr is built to perform in heavy stubble with its ability to cut the soil surface and subsurface residue, while ensuring consistent depth due to its parallel linkages. Once the heavy stubble has passed through the front of the machine, a row cleaner assembly removes the residue, while four adjustable down pressure springs per row apply pressure to assist with soil penetration and row unit preparation. Growers can choose from single or dual fertiliser tubes for the precise placement of fertiliser, with the machine built to lift and close the shank slot following placement. Peter’s Orthman 1tRIPr is set on a six row strip, with fertiliser placed at depths of 100mm and 200mm. Peter explained that they chose the Orthman 1tRIPr four seasons ago after noticing a visual yield advantage on nearby properties where strip till systems were being used. It was particularly noticeable at times of moisture stress, with fields that had been sown using strip till systems faring much better than those sown using conventional till systems. He points out that conventional till systems can lead to soil compaction as a number of passes are required to plough or till the soil prior to harrowing and fertiliser application. The proven popularity of strip till systems in the United States, where 70% of growers in the corn belt use them gave Peter additional confidence in his equipment choice.